Recently I have been putting the finishing touches to a chapter on Fenton Hort for a book to be published next month. Fenton Hort (1828-1892) was one of the three members of the ‘Cambridge Triumvirate,’ a group of Biblical scholars who worked tirelessly to produce a definitive version of the Greek New Testament that has influenced all subsequent English translations of the Bible. The other two members of the Cambridge Triumvirate were BF Westcott and JB Lightfoot, but it is often forgotten that Hort was born in Dublin, grew up in Leopardstown, and had strong family connections in Dublin, Kildare and Kerry. His close friends in Cambridge included the Christian socialists FD Maurice and Charles Kingsley, who strongly influenced his views on working class politics, the hymn writer John Ellerton, who was born to Irish parents and librarian Henry Bradshaw, whose father was from Milecross, Co Down. On my way into Limerick for last night’s debate in Saint Mary’s Cathedral, once again I passed Westward Ho!, the landmark pub in Mungret that sadly has been closed for some time and is now surrounded by fencing. Once again, I was reminded of Hort’s friend, Charles Kingsley, who was the author of Westward Ho! (1855), a novel that I found exciting as a schoolboy, although it had been published almost a century before I was born. Hort and Kingsley were close friends and neighbours in Cambridge, and when Westward Ho! was about to be published Kingsley sent the printer’s proofs to Hort, perhaps seeking not just a second opinion but approval too. Hort was particularly engaged by Chapter 5, with its descriptions of the Desmond rebellion in Limerick and Kerry, including references to Hort’s ancestors in the FitzMaurice family and the destruction of Carrigafoyle Castle. Others would later accuse Kingsley of anti-Irish racism, in this book and in The Water Babies. But Hort could hardly suppress his excitement at this pre-publication reading, and wrote eagerly about the new book to his friend the bibliophile Henry Bradshaw (1831-1886), who had moved to Dublin the previous year and had been appointed a master at Saint Columba’s College, Rathfarnham (1854-1856). Soon after these letters and the publication of Westward Ho!, Bradshaw returned to Cambridge to work in the library and as Dean of King’s College (1857-1858 and 1863-1865), and he was appointed the Cambridge University Librarian in 1867. 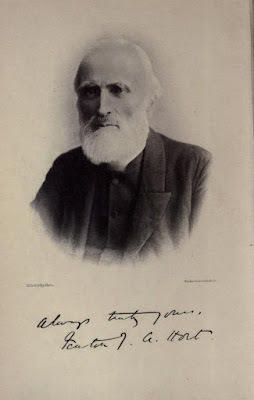 Many years later, in 1884, Blunt’s daughter Else married the Revd Joseph Newenham Hoare, a son of Archdeacon Edward Hoare (1802-1877) of Trinity Chapel, Limerick. At the time, Joseph Hoare was the curate of Holy Trinity Church, Muckross, a new church in Killarney, Co Kerry. Hort was her godfather and when he visited Dublin four years later to accept an honorary doctorate in Trinity College Dublin, he was eager to visit Kerry and the Atlantic coast, perhaps because he was descended through Lady Elizabeth FitzMaurice, his great-grandmother, from the Earls of Kerry, perhaps because he wanted to visit Else Hoare in Killarney. Fenced off because major renovation works are being held. Due to open again in November, thank goodness.